Dez Bryant hasn't been that good in years, but he was still Dallas' best receiver. There was once a time when former star wide receiver Dez Bryant was thought of as one of the five best players at his position in the NFL. On Friday, the Dallas Cowboys released him in a move to create salary cap space. Bryant had a total of 150 catches on 300 targets over the last three seasons, for a completion percentage of 50 percent when balls came his way. When Cowboys quarterbacks threw in another direction over that same span, they completed 67.9 percent of their passes. By releasing Bryant, the Cowboys will save $8.5 million against the cap in 2018, which in my view was a no-brainer decision for any team with realistic expectations of competing for a Super Bowl this season. I will note, however, that the timing of Bryant's release makes no sense whatsoever for Dallas. They could have used that money, before, you know, free agency came and went. After a fantastic season in 2016 that earned him NFL Offensive Rookie of the Year honors in 2016, quarterback Dak Prescott struggled in his second year. That passing game is going to scare nobody. The only other running backs on the Cowboys' roster currently are Rod Smith and Trey Williams, who have combined for just 59 carries over their careers. In other words, don't expect Elliott to get many breathers. The Cowboys are unquestionably going to see packed boxes all season long, and they're going to have to keep slamming Elliott into the line of scrimmage anyway. It's well documented that running backs in the modern NFL wear out far more quickly than players at other positions. If they rely too heavily on Elliott, which seems inevitable, the Cowboys will run the risk of putting significant mileage on a very talented player in a season where they are highly unlikely to compete for a Super Bowl. So how does the Dez Bryant release affect the Eagles? 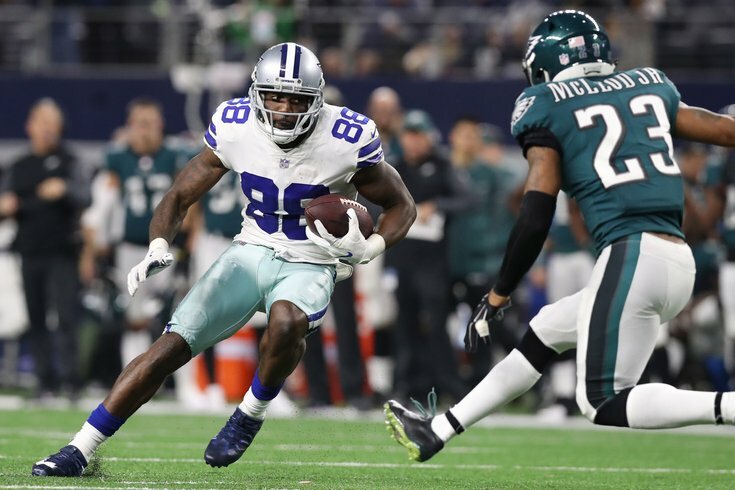 After his release, Bryant's immediate emotional reaction was to say that he wanted to play in the NFC East so that he could face his former team twice per season. The Eagles' newly hired wide receivers coach, Gunter Brewer, was Bryant's wide receiver coach when he was in college at Oklahoma State. The Eagles just won the Super Bowl, which attracts players seeking postseason opportunities. Ultimately, when Bryant cools down, his agent will talk him out of signing somewhere for far less money than he's worth just to spite his old team. With the Eagles set at wide receiver in 2018 and lacking salary cap space themselves, I wouldn't start picturing Bryant in an Eagles uniform. As for the "Are the Cowboys easier to beat now" question, yes, they probably are to some small degree. While we pointed out above that Bryant isn't the same receiver he once was, he was still the Cowboys' best receiver, and they don't have much in the way of a capable No. 1 type of receiver in house to replace him. In the short term, the Cowboys are worse because of this move. In the long term, it will be interesting to see (A) how they blow the added cap space acquired by releasing Bryant, and (B) if they reach for a wide receiver in the first round of the 2018 NFL Draft out of need.